• The story we shall read is set in the future, when books and schools as we now know them will perhaps not exist. How will children study then? The diagram below may give you some ideas. • In pairs, discuss three things that you like the best about your school and three things about your school that you would like to change. Write them down. • Have you ever read words on the television (or computer) screen? Can you imagine a time when all books will be on computers, and there will be no books printed on paper? Would you like such books better? (Activity) Calculate how many years and months ahead from now Margie's diary entry is. 6. Where was Margie's school? Did she have any classmates? Answer the following with reference to the story. 1. "I wouldn't throw it away." (ii) What does 'it' refer to? 2. "Sure they had a teacher, but it wasn't a regular teacher. It was a man." (i) Who does 'they' refer to? (ii) What does 'regular' mean here? 2. Why did Margie's mother send for the County Inspector? 5. What had once happened to Tommy's teacher? 1. Find the sentences in the lesson which have the adverbs given in the box below. A new revised volume of Isaac Asimov's short stories has just been released. Order one set. Write a letter to the publisher, Mindfame Private Limited, 1632 Asaf Ali Road, New Delhi, requesting that a set be sent to you by Value Payable Post (VPP), and giving your address. Your letter will have the following parts. The other part of the sentence tells us about a possible result. It tells us what will happen (if something doesn't happen). The verb in this part of the sentence is in the future tense (you'll feel/ you will feel). In groups of four discuss the following topic. 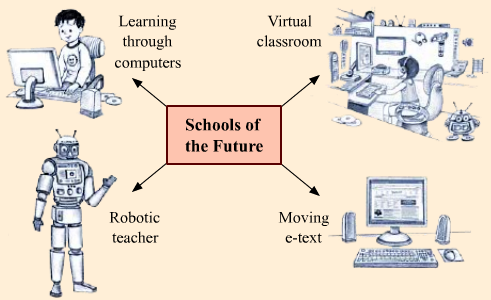 "The Schools of the Future Will Have No Books and No Teachers!" Beehive - English : CBSE NCERT Exercise Solutions & Summary for Class 9th for The Fun They Had will be available online in PDF book form soon. The solutions are absolutely Free. Soon you will be able to download the solutions.